1 tbsp of ground flax seed + 3 tbsp water to replace 1 egg. Just dry grind a few tablespoons of flaxseed for 10 to 15 seconds. You can store the extra powder in an airtight container (in the freezer) for later use. Since the recipe calls for two eggs, I did the needful, creamed all the wet ingredients and reached for the all purpose flour. I had just about a cup! So good old atta (whole wheat flour) came to my rescue. The result - not too bad! The cookies were slightly denser and did not easily flatten out like (I presume) they should (the absence of eggs could also be the reason for this). 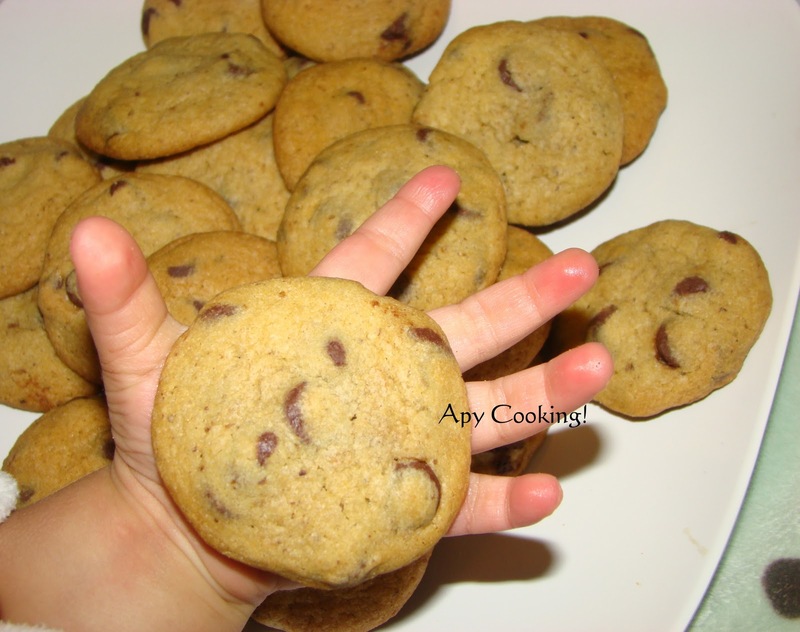 But they tasted great and crunchy with that li'l chewiness in them - the main reason why I loved chocolate chip cookies since I was a little girl! Since I was adding flax seeds, I added a little extra vanilla - just to make sure the nuttiness of the flax seeds did not overpower the taste of the cookies, but all was good at the end. Also, I added a little more baking soda since flax seeds do not have the leavening properties of eggs. I also used a little less chocolate chips than the original recipe. 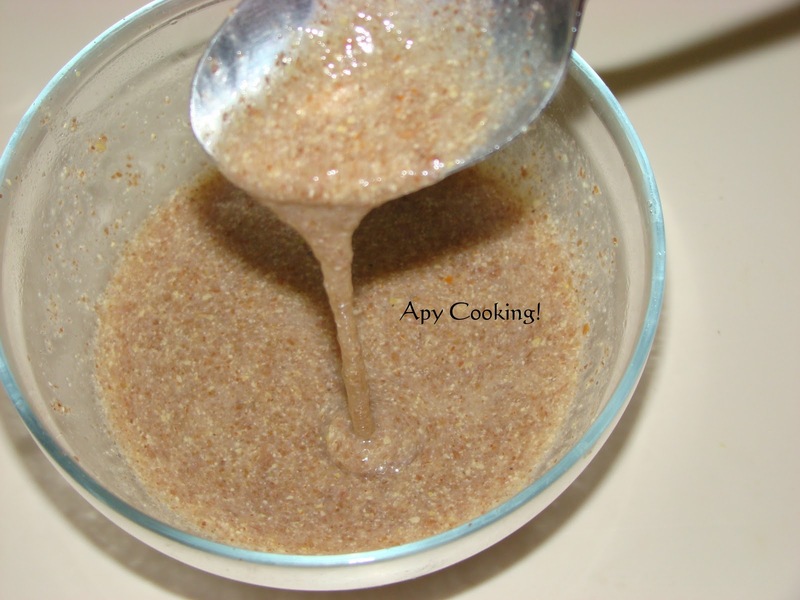 Mix 2 tbsp ground flax seeds with 6 tbsp warm water and set aside for 10 minutes until the mixture turns viscous. Meanwhile combine all purpose flour, wheat flour, salt and baking soda and set aside. In a separate (large) bowl, with an electric mixer, cream butter, sugar and brown sugar. Add vanilla and flax mixture and beat further. Add the flour mixture little by little and fold in with a spatula. 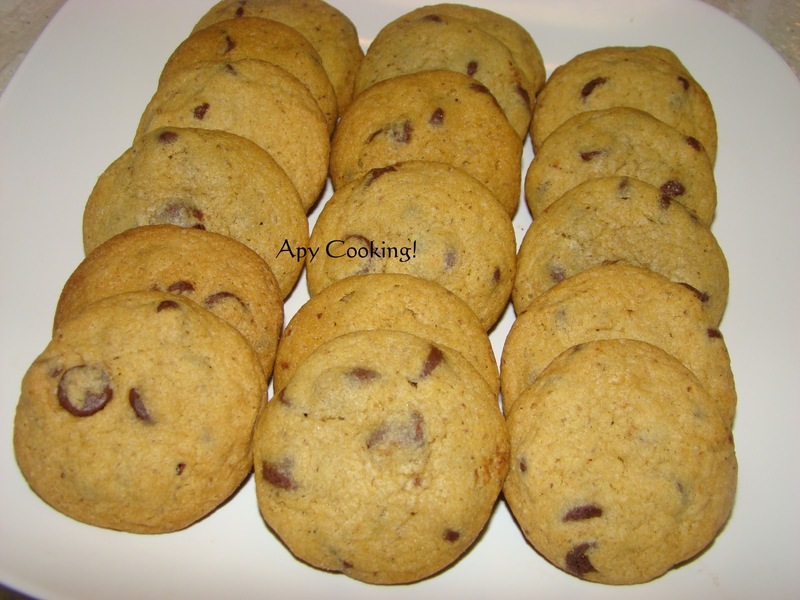 Since whole wheat flour is used here, mix gently - otherwise the cookies can become hard and dense; but make sure it's mixed well. Refrigerate the dough for about an hour. (Since it's winter now, I refrigerated it for just a few minutes. However if it is hot and humid, you need to refrigerate it for a longer time in order to roll the dough into balls. The original recipe doesn't call for refrigeration, but I do so since I prefer to roll the dough into balls). With a tablespoon, scoop out the dough and make balls. 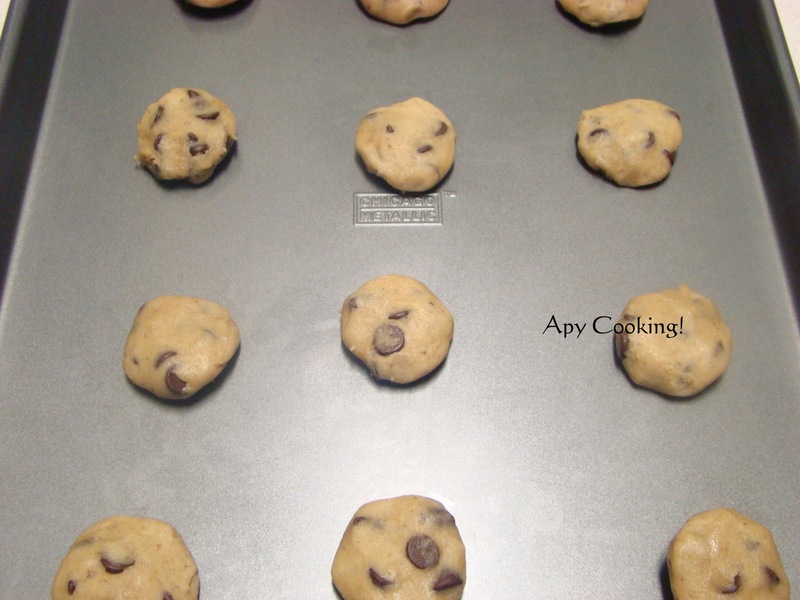 Place them on an ungreased cookie sheet, about two inches apart and flatten them a little with your fingers. Bake for about 11 minutes - till the the edges turn slightly brown. The center will be soft. Remove and allow to cool on the baking tray for two minutes. Transfer to a wire rack to cool completely. The center will harden once the cookies cool. Like I mentioned earlier, the cookies were slighlty dense, owing to the whole wheat. But I have no complaints since whole wheat is definitely a better option, specially for kids. 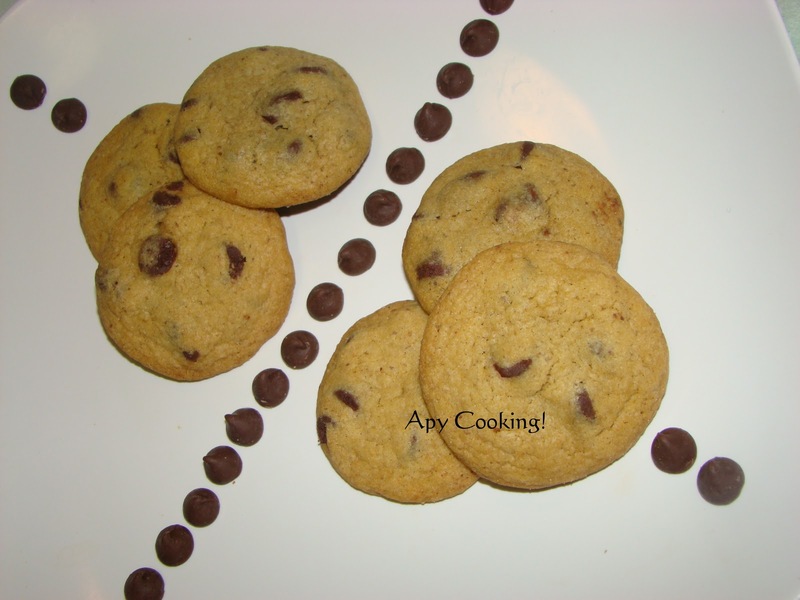 The recipe yields about 5 dozen cookies (great solution for a potluck party! 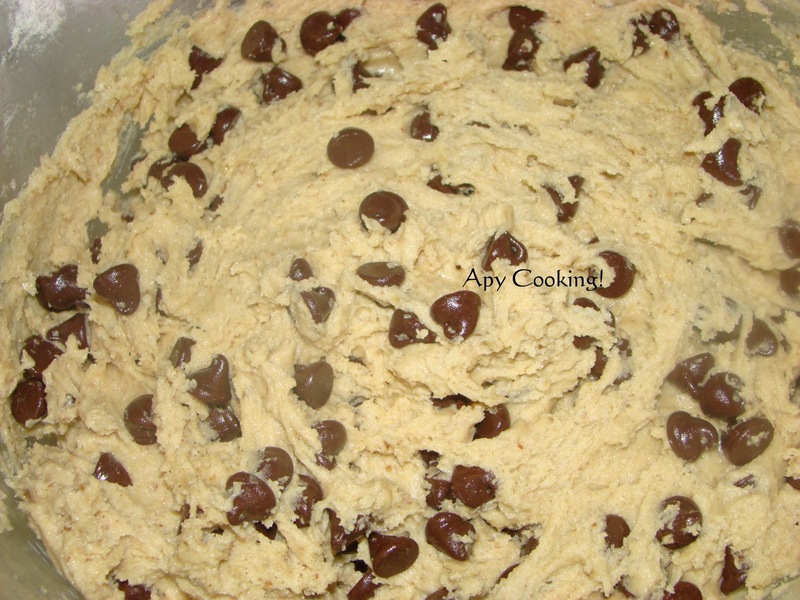 ), if you can refrain yourself from sneaking in some cookie dough to yourself. But I guess with the absence of raw eggs in the dough, it may not be too easy! Here's another dosa that you can make a few minutes before breakfast, instead of worrying about soaking and grinding the previous night. I got this recipe from my aunt Jyothi Prabhu who adapted it from here. Dry grind oats in the mixer (about 10 seconds). In a large bowl mix oats powder with the rest of the ingredients. 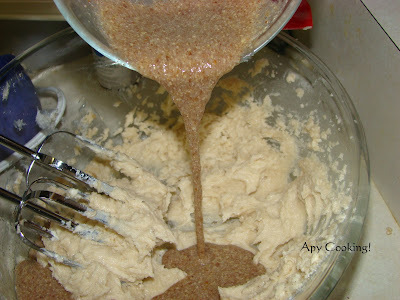 Add enough water and mix well to remove lumps [I use a manual whisk]. The batter must be of thin buttermilk consistency. Let stand for a few minutes. Roast on both sides. 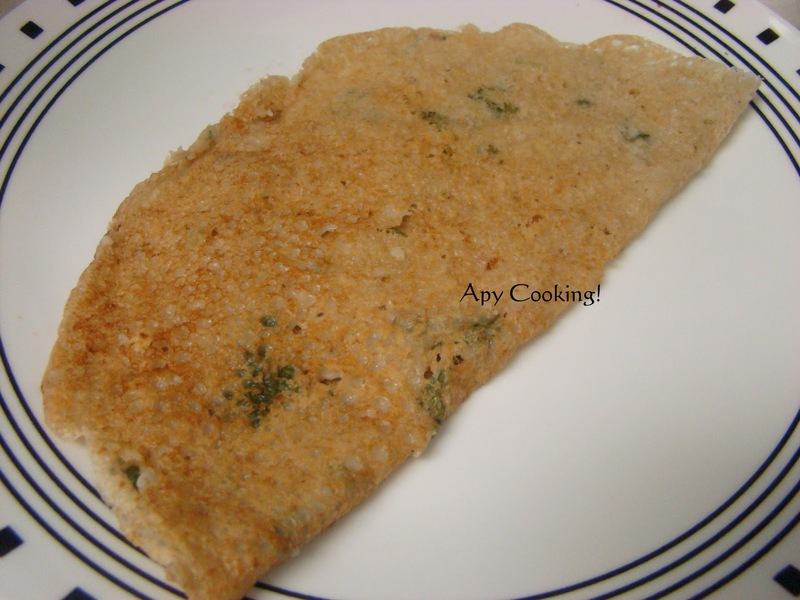 (You can refer Rice Flour Dosa for tips). Please note that they take a long time to roast, so do not flip until one side is completely cooked, otherwise it can break. 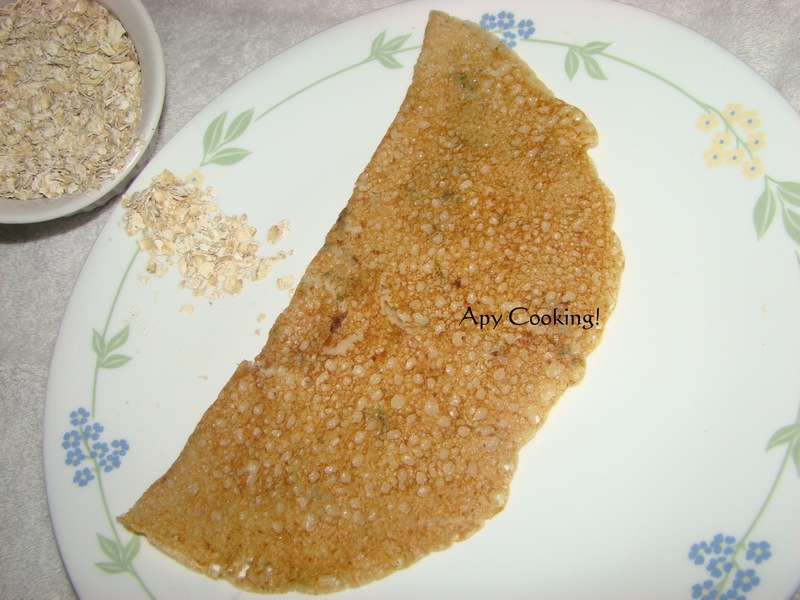 Oats dosa tastes great with Mint Chutney. Whenever I go to a grocery story, the deep purple coloured eggplants almost always lure me to buy them. Sometimes I give in, but mostly I don't because my husband is not a big fan of eggplants. 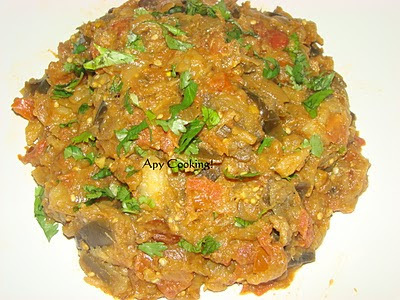 The other day when we were talking about something, DH (dear husband) mentioned he didn't like eggplants very much but he actually liked Baigan Bharta a lot. So the next time I went to the store, I dunked in a large eggplant and happily came home to make Baigan Bharta. I referred to this recipe on Vegtarian Concoctions. She mentions roasting the eggplant on open flame. I had once baked an eggplant and thought of doing so. But I was short on time, so I chose to microwave it since it's faster and hassle free. I also made some minor changes in the recipe. Rub about one tsp oil all over the eggplant. 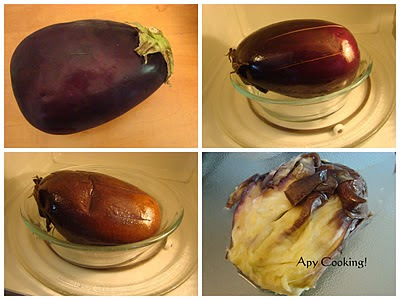 Make a few deep slits with a knife (otherwise the eggplant can burst in the microwave). Place in a microwave-safe bowl and microwave for 11 to 12 minutes. Allow to cool. Remove the eggplant from the microwave. Chop off the top (calyx) and peel off the skin. I do prefer the peel as well, so I left some of it on. Chop the eggplant and mash it a little bit. Heat oil in a deep bottomed pan. Add jeera. 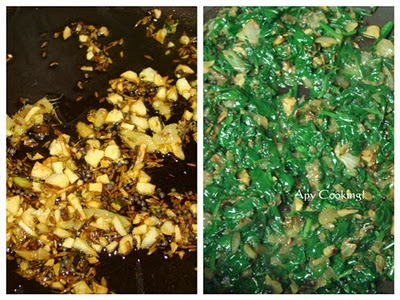 When it splutters, add ginger, garlic, green chillies and peanuts and roast for sometime. Add onions and saute till they turn translucent. Add all the powders and hing and roast for a couple of minutes. Toss in chopped tomatoes and saute till they are completely cooked. Mash lightly with the back of the spoon. Add chopped eggplant and roast it in the masala for 5 to 6 minutes. Add salt. 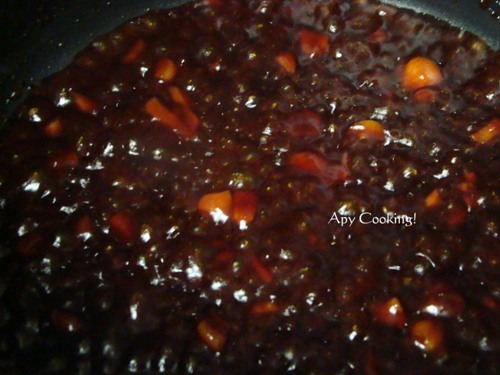 When I came across this recipe on Shailu's Kitchen, I was reminded of the sweet and sour chicken from Hao Hao that I used to love as a kid (and still do!) This is a completely different dish but honey and chilli seemed like a deadly combination and the sweet and spicy sauce lured me into trying it out. I had a lot of potatoes in the pantry so thought of using all of them. You can easily scale down the recipe as per your need. 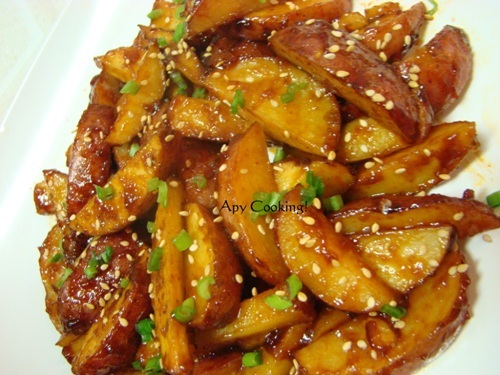 Chop potatoes into wedges/ fingers. Peel and chop garlic. In a large bowl, combine garlic, chilli powder, tomato sauce, oil and salt. Toss in the potato wedges and mix well. Adjust the salt. You can either bake the potatoes or fry them. 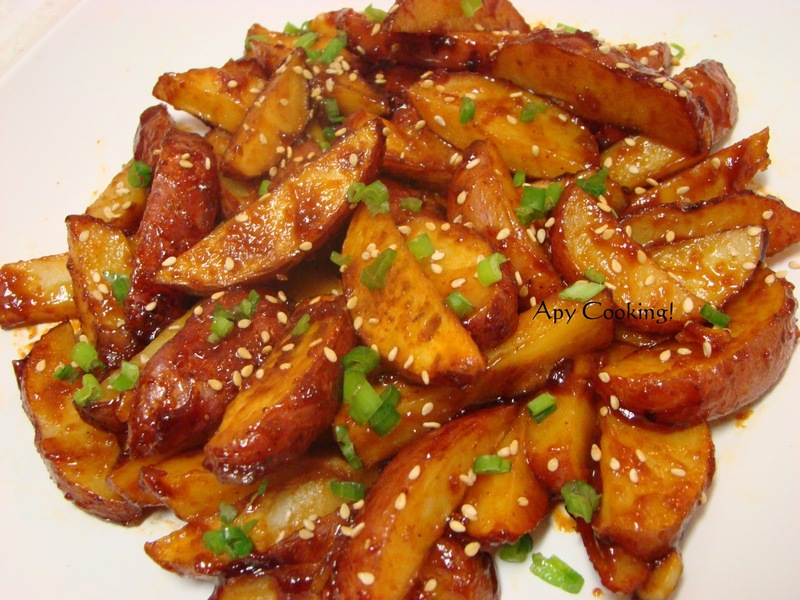 Shailu suggests adding cornflour instead of oil while frying the potatoes. For baking, line a large baking tray with greased foil. 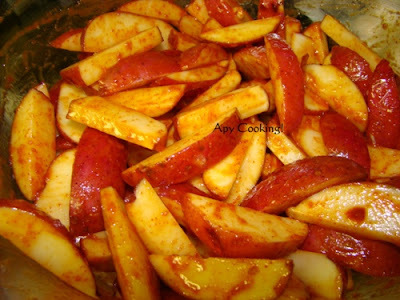 Place the potatoes (avoid overlapping) and bake at 400ºF till the potatoes are cooked - about 30 to 35 minutes. Turn the potatoes once in between. In a pan, heat 1 or 2 tbsp oil. Add garlic and roast till it turns golden brown . Add the rest of the ingredients for the sauce (except honey) and bring to a light boil. Add the baked / fried potatoes and honey and mix well. Cook for a couple of minutes until the potatoes are coated with the sauce. Garnish with spring onion greens and toasted sesame seeds. (If you have regular sesame seeds, just dry roast them on low heat). I added less honey because I wasn't sure if my husband would like the honey-chilli combo. But he did love this dish, so I will stick to this proportion. You could increase the honey if you prefer the dish a little sweeter. Hot pakodas on a cold rainy day serve as an excellent snack. 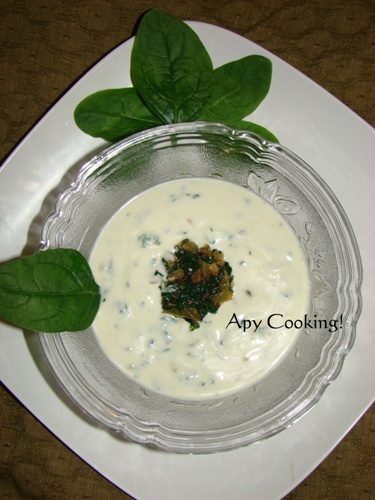 And what better way to have them than to dip them in a bowl of delicious mint chutney! I made these fritters yesterday for a Diwali party hosted by our dear friends Rajesh and Bhargavi. Luckily it wasn't raining last night and Rajesh's fireplace kept us warm, but we enjoyed the bajjis nevertheless! Blend all the ingredients (without water), into a smooth paste. You could add water instead of oil, the flavour will be slightly different. Add more water / oil if required and blend well. 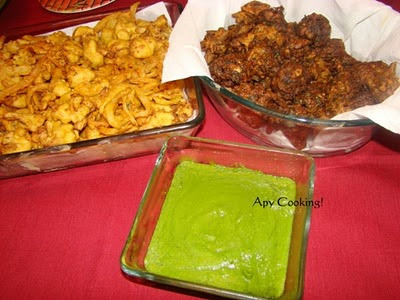 Relish with hot pakoras or succulent kebabs. You can even use this chutney as a marinade to make hariyali kebabs (use oil though and not water to grind). Idlis, dosas and samosas dipped in pudina chutney taste great too! 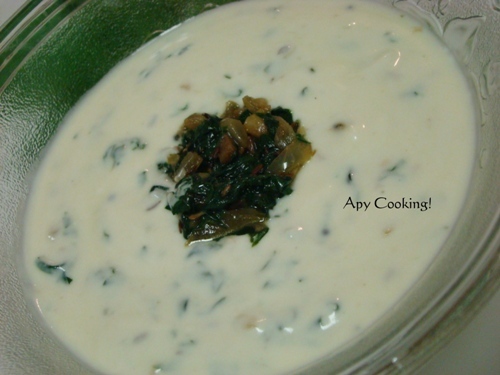 Here are a couple of recipes using pudina chutney as the marinade. I have made a few changes here and there. I first had this burfi at an aunt's place a couple of years back and loved it. 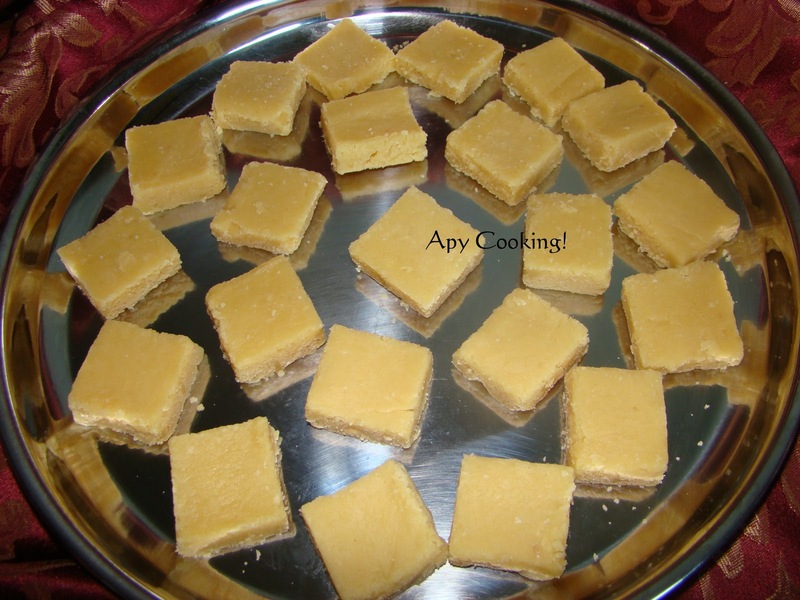 When she told me it's called 7-cup burfi, I thought it was made of a cup each of seven different ingredients. After that I forgot about it. When I came back home two months later, I was suddenly curious to know what the seven ingredients were. At that point of time, my aunt was fast asleep in India, so as usual I resorted to the internet for the answer. And that's when I realised that there were seven cups in total, and just 5 ingredients - besan (1 cup) , ghee (1 cup), milk (1 cup), coconut (1 cup) and sugar (3 cups). The first time I made this, I used the exact same measures. It tasted great but I found it a tad too sweet for my liking. The next time, I reduced the sugar by 1/4th cup and added 1/4th cup of cashewnuts instead. And that's how I've been doing it since then. 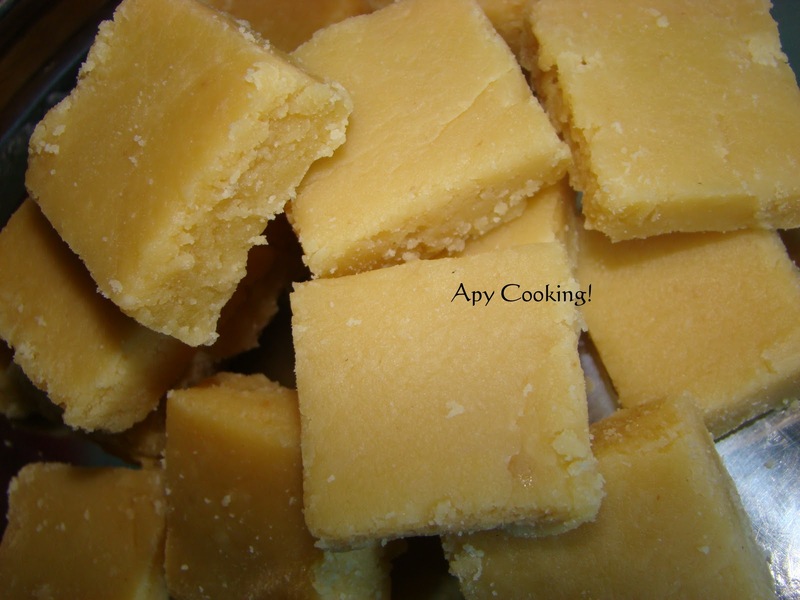 [Note : If you are making a burfi for the first time, I suggest you reduce the portions and use a 1/4 cup measure - 1/4 cup besan, 1/4 cup ghee etc. Cooking time will reduce accordingly]. 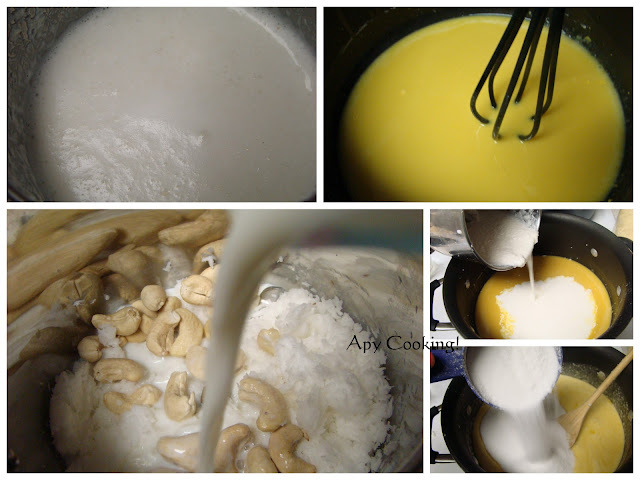 Blend the cashewnuts with coconut and milk for 10 to 15 seconds, to get a coarse runny mixture. In a deep bottomed pan [I prefer non-stick], with the flame on low, heat ghee and add besan. 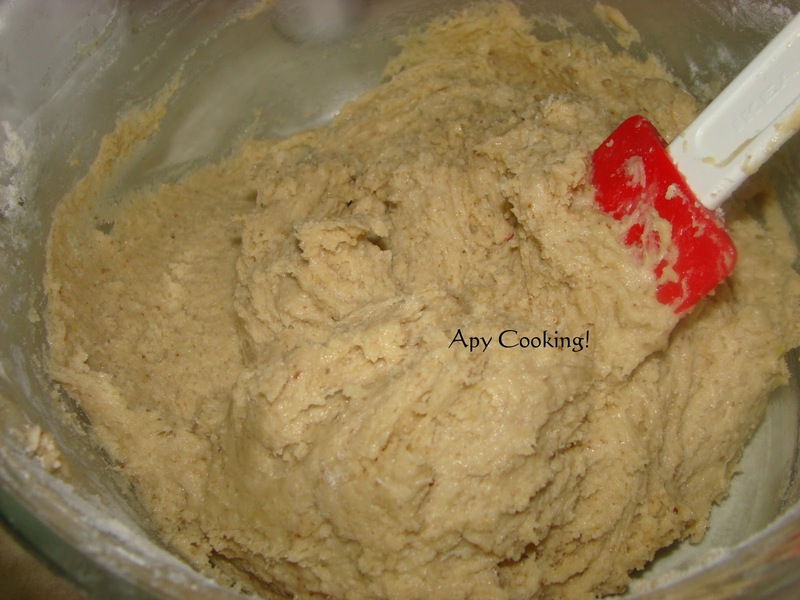 With a manual whisk or a large spoon, mix well to get rid of any lumps. Add the blended coconut, cashewnut and milk and keep stirring. Pour in sugar. Increase the flame to medium and keep stirring. The mixture will start to thicken. If you have to run around to attend to other chores and cannot be in front of the stove the whole time (just like me), just reduce the flame to low but make sure you stir the mixture atleast once every minute or else the bottom portion will get burnt. Otherwise, just continue to keep the flame on medium and stir every few seconds. Keep stirring till the mixture thickens so much that when you move the spoon in the mixture, the mixture should move along with the spoon (but should still be pour-able). This can take anywhere between 30 to 50 minutes, depending on how low or high the flame is. Sometime in between, grease a large plate [I used a 9X14 glass dish] with ghee. When the mixture attains the desired thickness, just pour it onto the plate. With a spatula or spoon, spread the mixture evenly. Allow to cool for about 15 minutes. 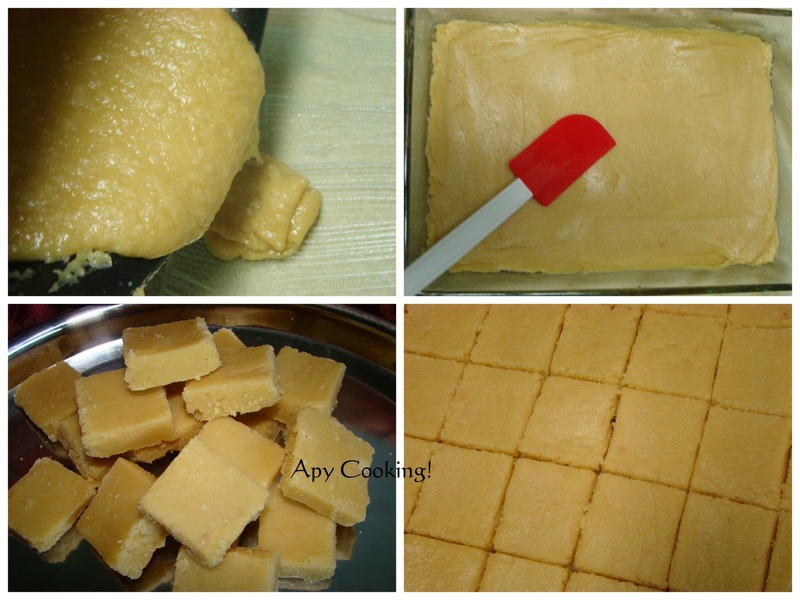 With a butter knife greased with ghee, cut into desired shape [ I cut mine into squares]. Do not remove from the plate yet. 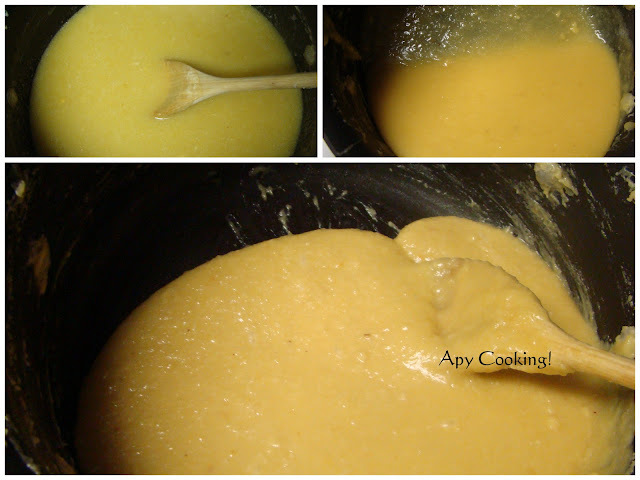 Once the mixture cools completely (this can take an hour or two) transfer into an airtight container and refrigerate. (If the burfi hasn't hardened by then, refrigerate it for a few hours so that it sets completely before serving). And thus I celebrated my 50th post :)!